I think GoDaddy is unreasonable when it comes to charging for their SSL certs. Yeah, turns out it’s not straightforward on GoDaddy without paying through the nose. She’s on Managed Hosting. 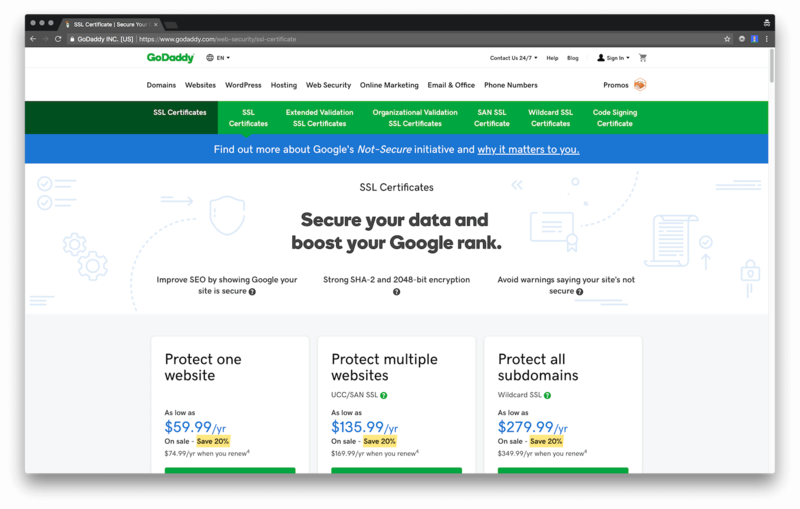 GoDaddy’s offering was $74.99 (as of 4th June, 2018, 09:41am GMT+1, currently discounted at $59.99/yr for the first year) at a time where everyone else pretty much just gives you the SSL for free. Okay, so let’s not buy GoDaddy’s SSL. There’s Cloudflare, and I can get a free one. Sign up for Cloudflare, change nameservers, turn on flexible SSL, turn on https redirect, and only https traffic, and that should be it, right? Sort of. For whatever reason some of the enqueued scripts and images in the content wouldn’t update to using https, despite the rewrite. So let’s change the configured home and site url to use https. Which we can’t. The fields are disabled, most probably because the values are declared as constants in the wp-config.php file, but there’s also a notice to call support, because they’ll do it for you. Which they’ll start with upselling the $74.99 SSL cert. And bam, just like that, the site is now on https. GoDaddy should not be pricing the SSL certs so high. For comparison, this is SiteGround (as of 4th June, 2018, 09:41am GMT+1), where even their most basic offering has free SSL included. I tried pinging folks from GoDaddy for a while on PostStatus Slack team, because I know there are a few of them there, but no one responded. I get that GoDaddy is publicly traded, and as such, their first and foremost concern is to make money, but they’re also big enough to be able to influence a large part of the internet. Advocating for security and safety should absolutely be part of that responsibility — which, ironically, they’re doing with the blue call-out to Google’s Not-Secure initiative —, but with predatory pricing like that, it paints a very different picture. Most consumers who end up using GoDaddy aren’t knowledgeable about the internet, and they’d believe what their host tells them, because the host knows best, right? It’s taking advantage of people who don’t know any better, and it makes me sad :(. 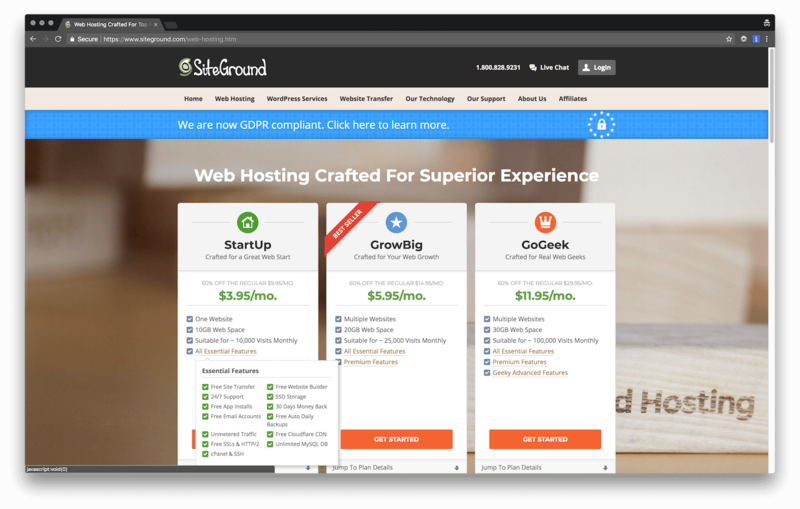 If you’re a consumer on GoDaddy, migrate to SiteGround. Now go forth and put the locks on your sites!